Spontaneously I just Google image searched “Happy Place”. Don’t ask why, I could never give an answer. 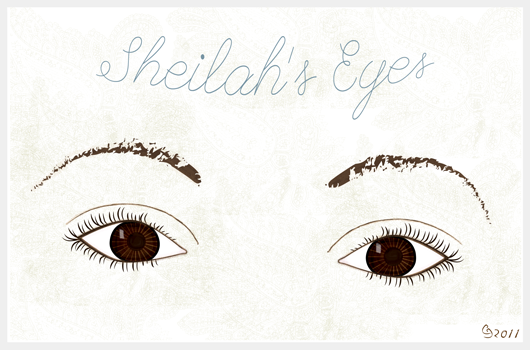 I came across this sketch of the girls eyes. I forgot all about the sunshine, sand and crystal blue waters that dominated the page. My mind went off in all directions. “Happy Place”. What and where is it really? I thought about my 3 Girls. I know their Happy Place. The place at the moment that sets them free. For one it is the Ballet Studio, the other it is School, at Home feeling secure is the oldest Child. Then I thought about me and the whirlwind began. When I was younger it was Home. Sitting in the Den watching football with my Dad. Accompanying my Mom who loved to play Bingo. Going to the park with my Dog. It was first as I got older that my need for “meditation” on the water grew. The one place I found solace. My “Happy Place”. Three years ago I was diagnosed with Cancer. I fought for strength and inner peace with two visions of what would be called my “Happy Place”. Yes, one just happens to be my favorite sandbar in the Gulf of Mexico, but the other was a Tree. Not just any old Tree, our massively beautiful Weeping Willow in the backyard of my home where we lived till I was 9. I went through boxes and boxes of photos until I found a photo of my Tree in the background. I would close my eyes and pull myself back to the time when it was my Happy Place. The place where I would lay down carelessly and watch the branches sway in the wind. I would contemplate how to navigate to the top in my bare feet. I would get lost in the time….peacefully…..the world was mine and mine alone. But I didn’t know then that someday, half a lifetime later I would rely on that Tree for spiritual power. If I only think of the Oceans as my Happy Place, I will miss the place of the moment. Out for a walk breathing free in the Forest air, the few and in between cars rides with goofy, funny conversations with my Daughters, Reading with my Partner on the terrace with sun in the sky. So many moments that the Happy Place is also just when the heart is in tune with your soul.
. And eyes.…..Looking into the eyes of my Loved ones. Don’t get me wrong…..I’ll still yearn for the beach as I am holed up here in Switzerland but now, thanks to this image, I will not forget to be aware that Happy Places can be found within. ← Public murder of my multitasking….right here.